Circadian rhythm is a 24-hour psychological and physiological fluctuations. The present study examined the effect of circadian rhythm on several physical and physiological parameters in male taekwondo athlete. For the circadian rhythm, daily time period was divided in hours as 0830-1030, 1130-1330, 1430-1630, 1730-1930, 2030-2230. Athletes chronotypical structures and sleep qualities were determined by Horne-Ostberg’s Morningness-Eveningness Questionnaire and Epworth Sleepiness Scale. Nine male athlete (age 19,22±1,9 year, stature 176,9±3,9 cm, body mass 66,9 ±11,9 kg) participated in this study. The athlete’s resting heart rates, intra-aural resting body temperatures were measured and counter movement jump test, paldeung technique effect level test and Wingate anaerobic power and capacity test were applied. The normality assumption of the data was examined by Shapiro-Wilks test. Time periods were compared using analysis of variance (ANOVA) followed by a LSD post-hoc test. Pearson correlation coefficient analysis was used to examine the relations between variables. Value of significance was accepted as p<0.05. Significant circadian change differences were observed in resting heart rates, intra-aural resting body temperatures, counter movement jump heights, paldeung technique effect levels and, mean power in Wingate test. A negative correlation coefficient was found between resting body temperature and resting heart rate. As a result; there are many factors affecting sports efficiency and in order to improve individual sporting performance, chronotypical features and the effects of circadian rhythm must be considered in designing training and competitions. taekwondo, circadian rhythm, wingate anaerobic test, counter movement jump. Afonso, L.D.S., Dos Santos, J.F.B., Lopes, J.R., Tambelli, R., Santos, E.H.R., Back, F.A., Barreto, L.M., Perrout de Lima, J.R. (2006). Maximal heart rate on treadmill at different times. Rev. Bras. Med. Esporte, 12(6), 285-289. Akkurt, S., Gür, H., Küçükoglu, S. (1996). Performans test sonuçlarının diurnal görünümü. Spor Hekimliği Dergisi, 31(3), 93-105. Baxter, C., Reilly, T. (1983). Influence of time of day on all-out swimming. Brit. J. Sports Med., 17(2), 122-127. Bernard, T., Giacomoni, M., Gavarry, O., Seymat, M., Falgairette, G. (1998). Time-of–day effects in maximal anaerobic leg exercise. Eur. J. App. Physiol, 77 (1-2), 133-138. Bessot, N., Nicolas, A., Moussay, S., Gauthier, A., Sesboüé, B., Davenne, D. (2006). Effect of pedal rate and time of day on the time to exhaustion from high-intensity exercise. Chronobiology International, 23(5), 1009-1024. Bougard, C., Bessot, N., Moussay, S., Sesboüé, B., Gauthier A. (2009). Effect of waking time and breakfast intake prior to evalution of physicial performance in the early morning. Cronobiology International, 26(2), 307-323. Briswalter, J., Bieuzen, F., Giacomoni, M., Tricot, V., Falgairette, G. (2007). Morning to evening differences in oxygen uptake kinetics in short-duration cycling exercise. Chronobiology International, 24(3), 495506. Burgess, H. J., Trinder, J., Kim, Y., Lu, D. (1997). Sleep and circadian influences on cardiac autonomic nervous system activity. Am. J. Physiol. Heart. Circ. Physiol, 273(4), 1761-1768. Callard, D., Davenne, D., Gauthier, A., Lagarde, D., Van, H. J. (2000). Circadian Rhythms in human muscular efficiency: continuous physical Exercise versus continuous rest. a crossover study. Chronobiology International, 17(5), 693-704. Chittababu, B. (2013). Time of effect on ıntra aural temperature and grip strength among handball players. International Journal of Current Life Science, 3(2),14-16. Falco C., Alvarez O., Castillo I., Estevan I., Martos J., Mugarra F., Iradi A. (2009). Influence of the Distance in a Roundhouse Kick’ Execution Time and Impact Force in Taekwondo. Journal of Biomechanics, 9;42(3):242-8. Febbraio, M. A., Snow, R. J., Stathıs, C. G., Hargreaves, M., Carey, M. F. (1996). Blunting the rise in body temperature reduces muscle glycogenolysis during exercise in humans. Experimental Physiology, 4(81), 685-693. Galliven, E. A., Singh, A., Michelson, D., Bina, S., Gold, P. W., Deuster, P. A. (1997). Hormonal and metabolic responses to exercise across time of day and menstrual cycle phase. Journal Applied Physiology, 83(6),1822-1831. Guette, M., Gondin, J., Martin, A. (2005). Time of day effect on the torque and neuromuscular properties of dominant and non-dominant quadriceps femoris. Chronobiology International, 22(3), 541–558. Hardin, P.E. (2000). From biological clock to biological rhythms. Biology, 1(4), 1-5. Hill, D. W., and Smith, J.C. (1991). Circadian rhytm in anaerobic power and capacity. Can. J. Sport. Sci, 16(1), 2-30. Inbar, O. Bar-Or, O. & Skinner, J. S. (1996). Wingate anaerobic test. measurement in pediatric exercise champaign, IL: Human Kinetics Books, Page 161-182. İşler, K. A. (2005). Anaerobik performansta sirkadiyen değişimlerin incelenmesi. Spor Bilimleri Dergisi, 16(4), 174-184. İşler, K. A. (2006). Time of day effects in maximal anaerobic performance and blood lactate concentration during and after a supramaximal Exercise. Isokinetics and Exercise Science, 14(4), 335-340. Johnson, D.L . and Bahamonde, R. (1996). Power output estimate in university athletes. J. Strength and Cond. Res.10(3), 161-166. Johns, M. W.(1992). Reliability and factor analysis of the epworth sleepiness scale. American Sleep Disorders Association and Sleep Research Society, 15(4), 376-381. Kline, C.E., Durstine, J., Davis, J., Moore, T.A., Devlin, T.M., Zielinski, M.R., and Youngstedt S.D. ( 2007). Circadian variation in swim performance. J. Appl. Physiol. 102(2), 641-649. Kurt, C. (2009). Sabah ve akşam saatlerindeki maksimal kan laktat konsantrasyonunun kronotip açısından değerlendirilmesi. Hareket ve Antrenman Bilimleri Anabilim Dalı Spor Bilimleri Programı, Doktora tezi, Ege Üniversitesi, İzmir. Manfredini, R., Manfredini, F., Fersini, C., Conconi, F. (1998). Circadian Rhythms, Athletic Performance and Jet Lag. Br J Sports Med, 32(2), 101-106. Oksa, J., Racinais, S., Hue, O. (2010). Exercise physiology: from to cellular integrative approach section 7: exercise in hot and cold environments. Physiology Publisher IOS pres. BV USA 403-421. Özdamar, H. (2009). Bayan Voleybolcularda günün farklı zamanlarının submaksimal ve koşu hızlarında kan laktat düzeyine ve anaerobik eşik noktasına etkisi. Yüksek Lisans Tezi, Abant İzzet Baysal Üniversitesi, Bolu. Pündük, Z., Gür, H., Ercan, G. (2005). Sabahçıl-Akşamcıl anketi Türkçe uyarlamasında güvenirlik çalışması. Türk Psikiyatri Dergisi, 16(1), 40-45. Reilly, T., and Down, A. (1986). Circadian variation in the standing broad jump. Perceptual and Motor Skills. 62(3), 830. Reilly, T., Atkinson, G., Edwards, B., Waterhouse, J., Farrelly, K., Fairhurst, E. (2007). Diurnal variation in temperature. mental and physical performance and tasks specifically related to football (soccer), Chronobiology International, 24(3), 507–519. Reilly, T., and Waterhouse, J. (2009). Circadian aspects of body temperature regulation in exercise, Journal of Thermal Biology, 34(4), 161-170. Sedliak, M., Finni, T., Cheng, S., Kraemer, W. J., Hakkinen, K. (2007). Effect of time of day specific strength training on serum hormone concentrations and isometric strength in men. Chronobiology International, 24(6), 1159–1177. Soussi, N., Gauthier, A., Sesboüe, B., Laure, J., Davenne, J. (2004). Circadian rhythms in two types of anaerobic cycle leg exercise : force-velocity and 30-s wingate tests, Int. J. Sports Med., 25(1), 14-19. Waterhouse, J., Drust, B., Weinert, D., Edwards, B., Gregson, W., Atkinson, G., Kao, S., Aizawa, S., Reilly, T. (2005). The circadian rhythm of core temperature : origin and some implications for exercise performance, Chronobiology International, 22(2), 207–225. ISNAD Can, Emek , Kutlay, Emine , Özkol, Mehmet , Çetinkaya, Caner . "THE EFFECT OF CIRCADIAN RHYTHM ON SOME PHYSICAL AND PHYSIOLOGICAL PARAMETERS IN MALE TAEKWONDO ATHLETES". 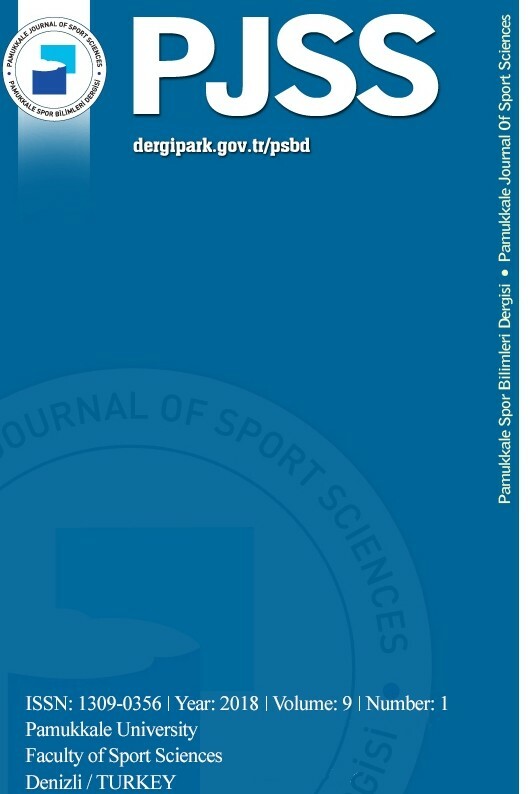 Pamukkale Journal of Sport Sciences 7 / 1 (January 2016): 12-24.